Aquatex is a professional grade fabric screen printing ink, now supplied to small business and home users as well as professional trade printers. Suited to printing 100% cotton through to 100% polyester, and all blends/ mixtures in between, Aquatex fabric inks are finally the one stop ink solution we have been waiting for. Pigmentation is microscopic, giving you deep rich colour using a smaller amount of ink with greater colour penetration and adherence into the material. Colours pictured above is as accurate to printed colour as possible. Some minor colour variations may occur when printed. 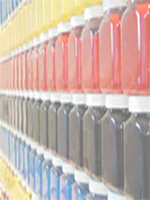 Test ink colour prior to printing if required.